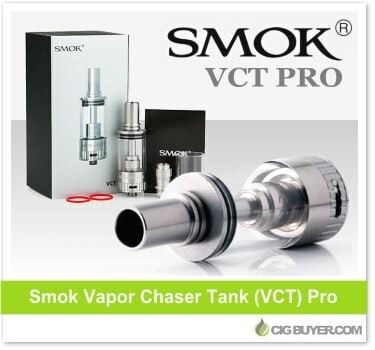 The Smok VCT Pro Tank is the upgrade version of the standard Smok VCT. Known as the Vapor Chaser Tank (VCT), it’s made of stainless steel and pyrex glass, but the Pro version is designed for high-powered mods with newly designed “VCT Pro E2” coils (0.2 or 0.6 ohm). Rather than using a single coil, the VCT Pro tank has dual vertical coils made with 100% organic cotton, so they can handle more power (30-80W) and produce outstanding flavor. The tank holds even more e-juice (5ml) and has drastically increased airflow with adjustable slots on the base and drip tip.